"What's funny is sometimes I'll get an email that'll say 'You guys are so biased.' But I won't know who we're supposed to be biased in favor of, because we get criticized a lot by both sides." For years, PolitiFact creator Bill Adair has excused PolitiFact from charges of bias by saying it receives criticism from both sides. Fact-checkers anticipate political criticism and develop reflexes for trying to defuse it. "We're going to make the best calls we can, in a pretty gutsy form of journalism," Bill Adair told NPR. "And when we do, I think it's natural for people on one side or the other of this very partisan world we live in are going to be unhappy." One strategy is responding only minimally or in carefully chosen venues, and always asserting their balance, often by showing the criticism they receive from the other side of the spectrum. Fact-checkers make this point constantly. The point of this strategy is obvious. The fact checkers imply that getting criticized from both sides indicates they are neutral--a form of the middle ground fallacy. But this month Adair, now ensconced in academia at Duke University helping run the Duke Reporters Lab, published research suggesting that the criticism fact checkers receive comes predominantly from conservatives (reviewed here). We find it disingenuous for Adair to use the "we get criticized from both sides" argument to emphasize PolitiFact's neutrality and then fail to question PolitiFact's neutrality after admitting the criticism from both sides is mostly from one side. Isn't it clear that PolitiFact's behavior is most likely the result of liberal bias? PolitiFact Bias co-editor Jeff D. caught PolitiFact pimping a flubbed fact check on Twitter, attaching it to the anniversary of the Orlando gay nightclub shooting. As we pointed out when PolitiFact first ran its fact check, there's a big difference between claiming a group is the most frequent target of hate crimes and claiming a group is at the greatest risk (on a per-person basis) of hate crimes. Blacks as a group experience the most targeted hate crimes (about 30 percent of the total), according to the imperfect FBI data. That makes blacks the most frequent targets of hate crimes, not gays and lesbians. Perhaps LGBT as a group experience a greater individual risk of falling victim to a hate crime, but we do not trust the research on which PolitiFact based its ruling. We doubt the researchers properly considered the bias against various small groups, such as the Sikhs. Don't take our word for it. Use the hyperlinks. There is reason to suspect the research was politicized. We recommend not drawing any conclusion until the question is adequately researched. What would we do without fact checkers? Clarification June 13, 2017: Added "(on a per person basis)" to accentuate the intended distinction. Also changed "greater risk" to "greater individual risk" for the same reason). Liberals like to consider the tendency of fact checkers to rate conservatives more harshly than liberals a fairly solid evidence that Republicans lie more. After all, as we are often reminded, "truth has a liberal bias." But the way fact checkers pick which stories to tell and what facts to check has a fundamental impact on how fact checkers rate claims by political party. Take a June 9, 2017 fact check from PolitiFact New York, for example. Lt. Gov. Kathy Hochul (D) of New York proclaimed that the state of New York has achieved pay equity. Hochul also proclaimed women are paid 90 cents on the dollar compared to men. Hochul's first claim seems flatly false, if we count women getting paid $1 for every $1 earned by a man as "pay equity." Her second claim, putting an accurate number on the raw gender wage gap, typically rates either "Half True" or "Mostly True" according to PolitiFact. PolitiFact tends to overlook the fact that the statistic is almost invariably used in the context of gender discrimination (see "Afters" section below). Hochul's numbers are slightly off. The data reveals a gender pay gap, but her point that New York state has a significantly smaller gap compared with the national average is correct. We rate her claim Mostly True. At PolitiFact Bias, we class these cases under the tag "tweezers or tongs." PolitiFact might focus on one part of a claim, or focus on what it has interpreted as the point the politician was trying to make. Or, PolitiFact might look at multiple parts of a claim and produce a rating of the claim's truthiness "on balance." PolitiFact in this case appears to use tweezers to remove "We have pay equity" from consideration. 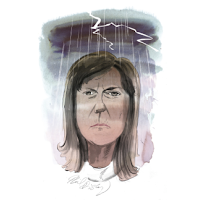 That saves the Democrat, Hochul, from an ugly blemish on her PolitiFact report card. The fact checkers have at least one widely recognized bias: They tend to look for problematic statements. When a fact checker ignores a likely problem statement like "We have pay equity" in favor of something more mundane in the same immediate context, it suggests a different bias affected the decision. The beneficiary of PolitiFact's adjusted focus once again: a Democrat. When this happens over and over again, as it does, this by itself calls into question whether PolitiFact's candidate "report cards" or comparisons of "Truth-O-Meter" ratings by party carry any scientific validity at all. Did Hochul make her gender wage gap claim in the context of gender pay discrimination? Our best clue on that issue comes from Hochul's statement, just outside the context quoted by PolitiFact New York, that "Now, it's got to get to 100 [cents on the dollar]." We draw from that part of her statement that Hochul was very probably pushing the typical Democratic talking point that the raw wage gap results from gender discrimination, which is false. Interpreting her otherwise makes it hard to see the importance of pay equity regardless of the jobs men and women do. We doubt the popularity of having gender pay equity regardless of the job performed, even in the state of New York. The acid test: Will women's groups react with horror if women achieve an advantage in terms of the raw wage gap? When men make only 83 cents on the dollar compared to women? Or will they assure us that the differences in pay are okay as it is the result of the job choices people make? We'll find out in time. The liberal bloggers/mainstream fact checkers at PolitiFact are expanding their "fake news" police mission at Facebook. While they're at it, they're publishing misleading reports. [STELTER:]Angie, there has been a lot of blowback already to this Facebook experiment. Some on the right are very skeptical, even mocking this. Why is it a worthwhile idea? Why are you helping Facebook try to fact-check these fake stories? HOLAN: Go to Facebook, and they are going about their day looking to connect with friends and family. And then they see these headlines that are super dramatic and they wonder if they're right or not. And when they're wrong, sometimes they are really wrong. They're entirely made up. It is not trying to censor anything. It is just trying to flag these reports that are fabricated out of thin air. Fact check journalists spent their energy insisting that "fake news" was just made-up "news" items produced purely to mislead people. The meme does not try to capture the appearance of a regular news story. It is primarily offering commentary, not communicating the idea that Florida legislators supported the Paris climate agreement. As such, it simply does not fit the definition of "fake news" that PolitiFact has insisted would guide the policing effort on Facebook. PolitiFact fact-checked Palin’s photo as part of our effort to debunk fake news on Facebook. Maybe PolitiFact should flag itself as "fake news"? Over and over we point out that PolitiFact uses the same varieties of deception that politicians use to sway voters. This fact check of Palin gives us yet another outstanding example. What did Palin do wrong, in PolitiFact's eyes? PolitiFact provided no good evidence Palin said any such thing. The truth is that Palin posted an Internet meme (we don't know who created it) that used an image that did not match the story. PolitiFact has posted images that do not match its reporting. We provided an example above, from a PolitiFact video about President Clinton's role in signing the North American Free Trade Agreement. If we reported "PolitiFact said George W. and Jeb Bush Negotiated NAFTA," we would be giving a misleading report at best. At worst we'd be flatly lying. We apply the same standard to PolitiFact that we would apply to ourselves. We sent a message to the writer and editor at PolitiFact Florida responsible for this fact check. We sent it before starting on the text of our post, but we're not waiting for a response from PolitiFact because PolitiFact usually fails to respond to substantive criticism. If we receive any substantive reply from PolitiFact, we will append it to this message and amend the title of the post to reflect the presence of an update (no, we won't hold our breath). Your fact check of Sarah Palin's Paris climate accord meme is disgraceful for two big reasons. First, you describe the fact check as part of the Facebook effort to combat "fake news." After laboring to insist to everyone that "fake news" is an intentionally false news item intended to mislead people, it looks like you've moved toward Donald Trump's definition of "fake news." The use of a photograph that does not match the story is bad and unethical practice in professional journalism. But it's pretty common in the production of political memes. Do you really want to expand your definition of "fake news" like that, after trying to reassure people that the Facebook initiative was not about limiting political expression? 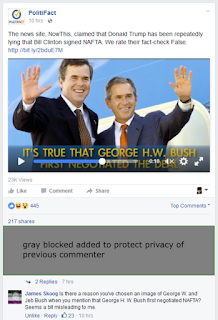 Would you want your PolitiFact video identifying George W. Bush/Jeb Bush as George H. W. Bush classified as "fake news" based on your use of an unrelated photograph? Purported by whom? It's implied, not stated. Do you seriously think the purpose of the post was to convey to the audience that Florida legislators were either responsible for the Paris agreement or celebrating it? That would truly be fake news as PolitiFact has tried to define it. But that's not what this meme does, is it? You're telling the type of half-truth you claim to expose. In part one of "PolitiLies at PolitiFact Wisconsin," we shared our experience questioning PolitiFact's reporting from a fact check of U.S. Rep. Glenn Grothman (R-Wis.). In part two, we will look at PolitiFact Wisconsin's response to having a clear error pointed out in one of its stories. On May 11, 2017, PolitiFact Wisconsin published a "Pants on Fire" rating of U.S. Rep. Paul Ryan's claim that "Air Force pilots were going to museums to find spare parts over the last eight years." PolitiFact issued the "Pants on Fire" ruling despite a Fox News report which featured an Air Force captain, identified by name, who said the Air Force had on seven occasions obtained parts for B-1 bombers from museums. The only example Ryan’s office cited was a May 2016 Fox News article in which an Air Force captain said spare parts needed for a B-1 bomber at a base in South Dakota were taken from seven "museum aircraft" from around the country. The museums weren’t identified and no other details were provided. Yet when we attempted to verify PolitiFact Wisconsin's reporting, we found the text version of the story said Capt. Travis Lytton (no other details were provided?) showed the Fox reporters a museum aircraft from which a part was stripped. Lytton also described the function of the part in the story (no other details were provided?). The accompanying video showed a B-1 bomber situated next to the name of the museum: South Dakota Air and Space Museum. If one of the seven museums was not the South Dakota Air and Space Museum, then the Fox News video was highly misleading. The viewer would conclude the South Dakota Air and Space Museum was one of the seven museums. How did PolitiFact Wisconsin miss this information? And why, when Lytton was plainly identified in the Fox News report, did PolitiFact Wisconsin not try to contact Lytton to find out the names of the other museums? "Readers who see an error should contact the writer or editor"
We like to contact the writer and the editor when we see an error. Your rating of Speaker Ryan's claim about the Air Force pulling parts from museum planes falsely claims that none of the seven museums were identified. Yet the Fox News report said the Air Force officer showed reporters the museum plane from which a part was taken. And if you bothered to watch the video associated with the story, the name of the museum appears very plainly in front of the B-1 bomber the officer identified. And if the names of the museums was a point worth mentioning, then why not contact the officer (identified by name in the Fox News report) and ask him? If he identified one of the museums, would he not identify the others? After nearly a week, we have received no reply to our message and the PolitiFact Wisconsin fact check still features the same false information about the Fox News report. Update June 10, 2017: On June 2017 we received a message from PolitiFact Wisconsin editor Greg Borowski. Borowski said he had not received our email message (we do not know if writer Tom Kertscher, to whom it was also sent, had the same experience). Borowski said after finding out about the criticism PolitiFact Wisconsin "added a note to the item." PolitiFact Wisconsin removed two false statements from its fact check, one stating that the Fox News report identified none of the museums from which airplane parts were taken, and one stating that the report featured no other details beyond those mentioned in the fact check. Editor's note: This item was updated on June 9, 2017 to say that the Fox News report did identify one museum. That information does not change the rating. As with the other correction we helped prompt this week, we are impressed by PolitiFact Wisconsin's ability to commit an error and then fix the error without admitting any mistake. The editor's note says the fact check was changed "to say the Fox News report did identify one museum." Why was that change made? The editor's note doesn't say. The truth is the change was made because PolitiFact Wisconsin made a mistake. It's appropriate for journalists to admit to making mistakes when they make them. We do not care for the spin we see in PolitiFact Wisconsin's update notices. Are we being too tough on PolitiFact Wisconsin? We think noted journalist Craig Silverman would agree with us. Correction June 14, 2017: Commenter Vinni BoD noticed our update was dated Sept. 2017. The month was actually June, which was the correct month in two spots where we (inexplicably) had "Sept." instead. He added that the group is an outspoken advocate for what he termed "controversial" services such as birth control. The notion that birth control services count as controversial looked suspiciously like the result of a liberal press filter. Curious whether the context of Grothman's statement supported PolitiFact Wisconsin's telling, we had a look at the context (17:55 through 20:55). The crosstalk made it a bit hard for us to follow the conversation, but a partial transcript from an article by Jen Hayden at the left-leaning Daily Kos seemed reasonably accurate to us. Note the site also features a trimmed video of the same exchange. It looked to us as though Grothman mentioned the "controversial programs" without naming them, instead moving on to talk about why his constituents can do without Planned Parenthood's role in providing contraceptive services. Just before Grothman started talking about alternatives to Planned Parenthood's contraceptive services, an audience member called out asking Grothman for examples of the "controversial programs." That question may have led to an assumption that Grothman was naming contraceptive services as an example of "controversial programs." Upon reading your recent fact check of Republican Glen Grothman, I was curious about the line claiming Grothman called birth control a "controversial" service. I watched the video and had trouble hearing the audio (I've found transcripts that seem pretty much correct, however). It sounded like Grothman mentioned Planned Parenthood's support for some controversial services, then went on to talk about the ease with which people might obtain birth control. Was there some particular part of event that you might transcribe in clear support of your summary? From what I can tell, the context does not support your account. If people can easily obtain birth control without Planned Parenthood's help, how would that make the service "controversial"? It would make the service less necessary, not controversial, right? I urge you to either make clear the portion of the event that supports your interpretation, or else alter the interpretation to square with the facts of the event. By that I mean not guessing what Grothman meant when he referred to "controversial programs." If Grothman did not make clear what he was talking about, your account should not suggest otherwise. If you asked Grothman what he was talking about and he made clear he believes birth control is a controversial service, likewise make that clear to your readers. Dave has reached out to Grothman's office. So, you;ll [sic] have to be patient. By June 4, 2017 we had yet to receive any further message with evidence backing the claim from the article. We sent a reminder message that day that has likewise failed to draw a reply. It looks like PolitiFact Wisconsin did careless reporting on the Grothman story. The story very likely misrepresented Grothman's view of the "controversial programs" he spoke about. Grothman's government website offers a more reliable account of what Grothman views as Planned Parenthood's "controversial" programs. It appears PolitiFact Wisconsin is aware it published something as fact without adequate backing information, and intends to keep its flawed article as-is so long as it anticipates no significant consequences will follow. Also see PolitiLies at PolitiFact Wisconsin II, published the same day as this part. We are impressed by PolitiFact Wisconsin's ability to run a correction while offering the appearance that it committed no error. Saying the original item "quoted Grothman" gives the reader the impression that Grothman must have misspoke. But benevolent PolitiFact Wisconsin covered for Grothman's mistake after his office clarified what he meant to say. It's really not a model of transparency, and offers Grothman no apology for misrepresenting his views. We stick with our assessment that PolitiFact Wisconsin reported carelessly. And we suggest that PolitiFact Wisconsin's error was the type of error that occurs when journalists think they know how conservatives think when in reality the journalists do not know how conservatives think (ideological bias). On the bright side, the portion of the fact check that we criticized now reads as it should have read from the start. We credit PolitiFact Wisconsin for making that change. That fixes the main issue, for there's nothing wrong with having a bias if it doesn't show up in the reporting. Of secondary importance, we judge the editor's note was subtly misleading and lacking in transparency. We also note with sadness that the changes to PolitiFact Wisconsin's story do not count as either corrections or updates. We know this because PolitiFact Wisconsin added no "corrections and updates" tag to the story. Adding that tag would make a fact check appear on PolitiFact's page of stories that have been corrected or updated. Correction June 9, 2017: Removed a redundant "because" from the final paragraph of the update. PolitiFact's central deception follows from its presentation of itself as a "nonpartisan" and neutral judge of facts. A neutral fact checker would apply the same neutral standards to every fact check. Naturally, PolitiFact claims it does just that. But that claim should not convince anyone given the profound level of inconsistency PolitiFact has achieved over the years. To illustrate PolitiFact's inconsistency we'll use an example from 2014 via PolitiFact Rhode Island that we just ran across. Luecke correctly explained that comparing the numbers from the Solar Foundation's job census to "coal mining" jobs represented an apples-to-oranges comparison. PolitiFact Rhode Island did not take the rigged comparison into account in rating Whitehouse's claim. PolitiFact awarded Whitehouse a "True" rating, defined as "The statement is accurate and there’s nothing significant missing." We infer from the rating that PolitiFact Rhode Island regarded the apples-to-oranges comparison as insignificant. PolitiFact awarded Romney's claim its lowest-possible "Truth-O-Meter" rating, "Pants on Fire." If Romney's claim was "meaningless" thanks to advances in military technology, is it not reasonable to regard Whitehouse's claim as similarly meaningless? PolitiFact Rhode Island didn't even mention government subsidies of the solar energy sector, nor did it try to identify Whitehouse's underlying argument--probably something along the lines of "Focusing on renewable energy sources like solar energy, not on fossil fuels, will help grow jobs and the economy!" Comparing mining jobs to jobs for the whole solar energy sector offers no reasonable benchmark for comparing the coal energy sector as a whole to the solar energy sector as a whole. Regardless of whether PolitiFact's people think they are neutral, their work argues the opposite. They do not apply their principles consistently.